While delivering her vision of how we might “reimagine free speech,” philosopher Rae Langton outlined four required conditions for a healthy free speech environment. First, free speech is for people not for corporations. Second, a successful free speech culture depends upon equality — everyone should feel empowered to participate without fear of reprisal from whomever — whereas forced silence is the result of hierarchy. Third, it requires a supportive community that provides people the training and education necessary to pursue and insist upon the truth. A society that is serious about free speech, Langton said, needs to be serious about supporting the capabilities in people that foster a culture of knowledge, for example, creating educational programs that encourage critical thinking. Last, speakers, active listeners and engaged bystanders who support an egalitarian, knowledge-seeking society are needed for free speech. 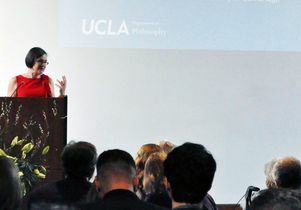 Langton, the Knightbridge Professor and chair of the philosophy department at the University of Cambridge in England, was on campus as the UCLA Department of Philosophy’s first distinguished lecturer. Langton works in moral and political philosophy, history of philosophy, metaphysics, philosophy of law, speech act theory and feminist philosophy. She has a long-standing interest in speech acts and social justice. Her “Re-imagining Free Speech” talk on Feb. 1 capped a week-long visit that included two seminars on her papers — “Blocking as Counter-Speech” and “The Authority of Hate Speech” — on how speech may establish authority and how it may also be marshalled to resist abusive authority. Made possible by the Kaplan Panzer Philosophy Endowment, the distinguished lecturer program is intended to help connect philosophical thought to a wider audience by inviting a leading philosopher to give a public talk. During her talk, Langton stressed that passivity is a threat to a flourishing free speech culture. Her suggestion to do more involved criticizing one standard defense of free speech. The question-and-answer period featured some lively exchanges. Langton was asked about commercial speech and commercial forces that foster falsehoods to gain readers and sell ads. Langton pointed out that neither corporate speakers nor robot speakers are speakers in the sense that the most compelling defenses of freedom of speech, such as those offered by John Stuart Mill or Justice Brandeis, have in mind. Those defenses imagined truth-seeking thinkers engaged in sincere, if impassioned, discussions responsive to reasons. “The extent to which free speech applies to them is parasitic on how free speech applies to ordinary citizens,” said Langton, who drew a contrast between her critiques of corporate speech and the media’s right to free speech. Visting law professor Larry Sager asked if there was a conceptual difference between silencing and being on the losing side of an argument. Rae Langton, the Knightbridge Professor and chair of the philosophy department at the University of Cambridge.